I have the honor of helping my friends Rose and TD plan their upcoming wedding in April, and they have chosen a purple and gold wedding theme. The first thing they did was to identify what colors they wanted, then from there we developed the theme - an orchid inspired tropical wedding theme. When planning a wedding, it's a good idea to work on your colors or a theme first - then from there you can start shopping for your flowers, wedding favors, bows, dresses, table arrangements and wedding decorations. 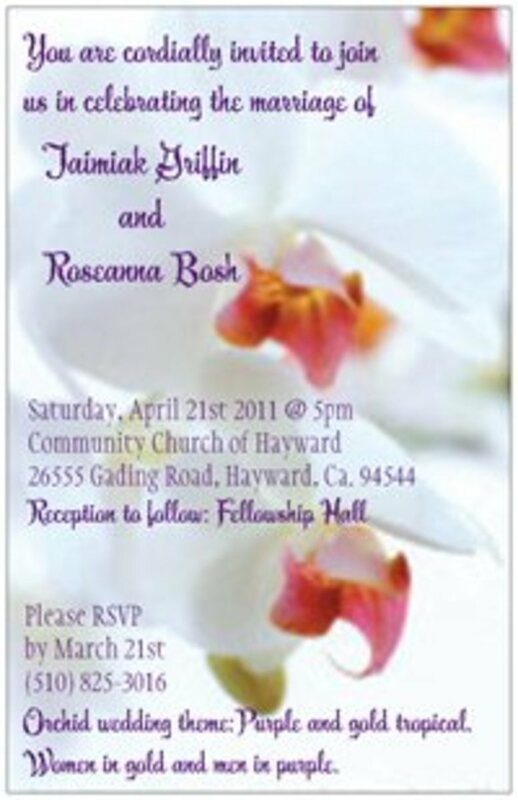 The photo that inspired Rose and TD is the one that they found on Google images by searching "purple and gold wedding". Beautiful inspiration! A tropical delight! Vivid and stunning white phaleonopsis orchids with magenta throats bloom profusely throughout this silk bridal bouquet. Although Rose and TD wanted purple and gold as their wedding colors, we realized we also needed a theme to go along with these colors. 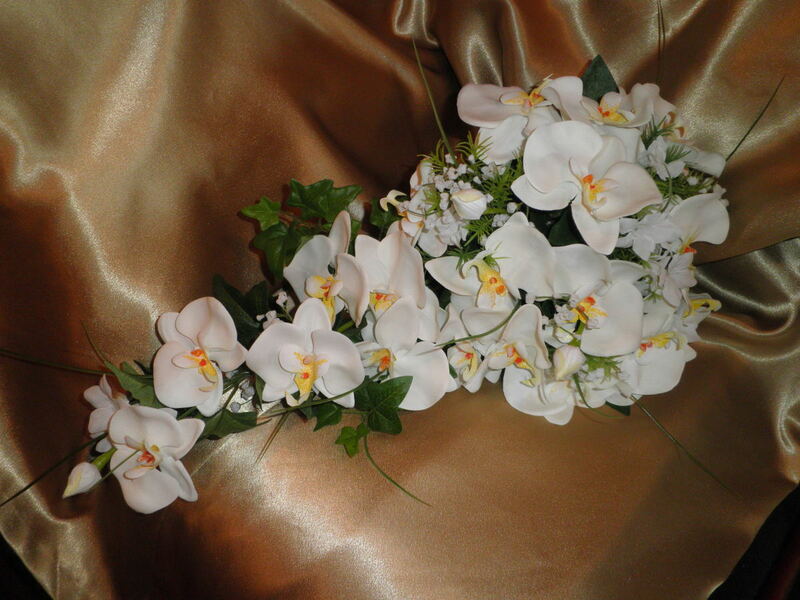 The theme quickly came once Rose picked out her flower bouquet which is made out of white phaleonopsis orchids. This bouquet she is going to order through Amazon. Because she knew she wanted a bouquet that she could save as a keepsake, a bouquet made out of artificial silk flowers was the perfect choice! 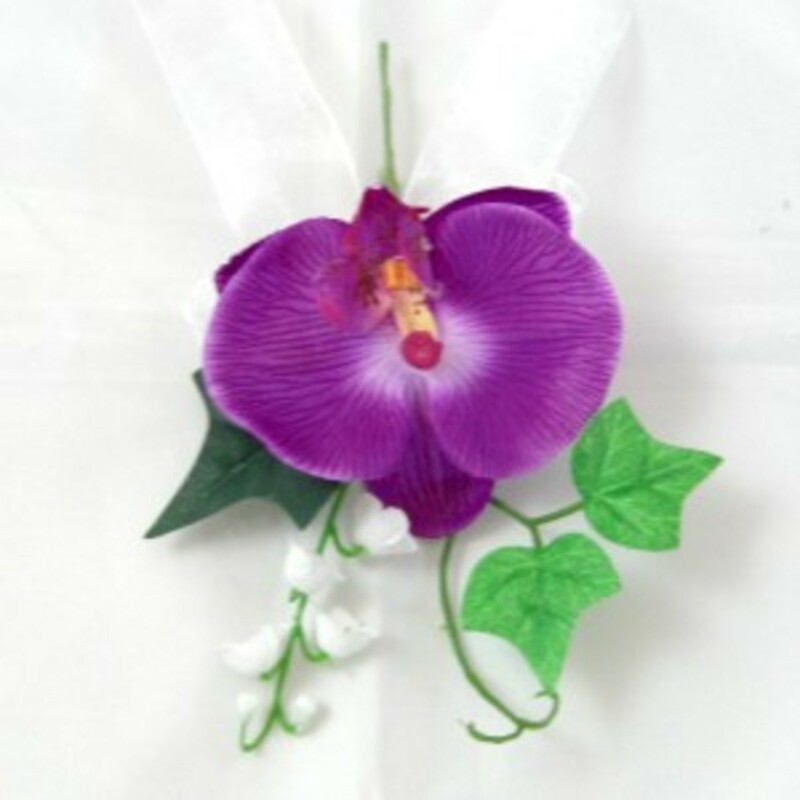 Once Rose picked out her theme, we realized that we needed to start looking for other related matching wedding accessories to match the purple and gold orchid wedding theme. I found boutonnieres to match the brides bouquet - and a slightly different orchid for the groom (she wanted a solid purple flower for him since he will be dressed all in white) The best mans boutonniere will also be ordered from Amazon, and the grooms boutonniere will actually be made from the flowers out of the bouquets that are going to be used as table decorations. One of the things that I did not mention is that we are also doing this wedding on a budget. We expect to spend less than $1,000 for everything - so we are being very budget conscious when making choices. The aim is to have a beautiful and elegant wedding without breaking the bank. One of the ways we are saving money is by buying 14 matching bridesmaids bouquets on EBay for only $4.95 each. 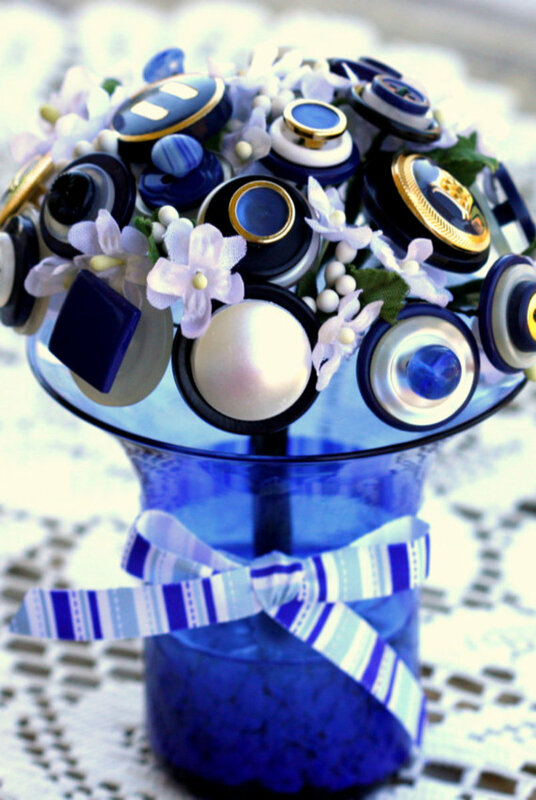 These bouquets will serve many purposes. We are going to use many of these bouquets in the church as pew decorations - then before the reception starts, we will re-locate the bouquets into in the adjoining reception hall where they will be used as table decorations. 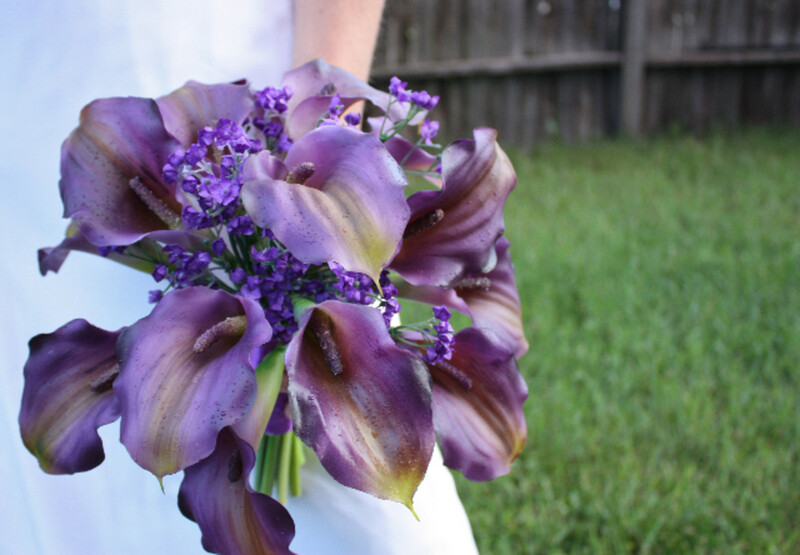 The maid of honor will also carry one of the bouquets, and the throw-away bouquet will also be this same bouquet. So with some major decisions made about the colors, theme and flowers, we turned our attention to some other things like decorating the hall where the reception is to be held. Since we are using the flowers from the church for the table centerpieces, all we needed to do was decide how to decorate the hall. Since the bride and groom really loved the original inspiration photo, we decided to re-create something similar to this look by buying rolls of tulle from Amazon. These will be draped from the ceiling to the floor, and gold runners will be used over white table cloths to re-create a very similar look. Chairs and tables are already furnished in the reception hall. Of course one of the most important parts of a wedding is getting the word out - so for invitations I went to Vista Print and hand designed Rose and TD's invitations for them (I am a graphic designer so this was a lot of fun for me) Even if you are not a designer, Vista Print is still a great place to order inexpensive announcements for your wedding. They have a lot of pre-made templates you can choose from if you don't want to design your own. To the right are the invitations that I designed for Rose and TD. On the backside of the invitation, we added a verse from Corinthians that will be used in the wedding ceremony, along with orchid graphics and a photo of Rose and TD. Because we bought the invitations while Vista Print had a holiday sale going on, they ended up paying less than 70 cents each for the invitations - and these are 5"x7" on a linen finish. One of the suggestions I made to Rose what that I thought a cute wedding box to hold all the cards would be a great way to keep all the cards in one place (I wonder how many wedding cards are lost or left because there is no exact place to put them?) Although I had looked at some articles and hubs on how to make a wedding box, we decided that for the price it would easier to order one already made from Amazon. This box will also make a great box to keep all their wedding mementos in after the wedding. Since the flower girls dress is going to be white, it was decided that gold would be used for the flower girls accents. A cute little headband made with gold silk flowers and bows will adorn her hair. How cute! Oddly enough, as much as we got done, we almost forgot one important part of the wedding - the cake! We laughed when we realized we hadn't even thought about what kind of cake they wanted. 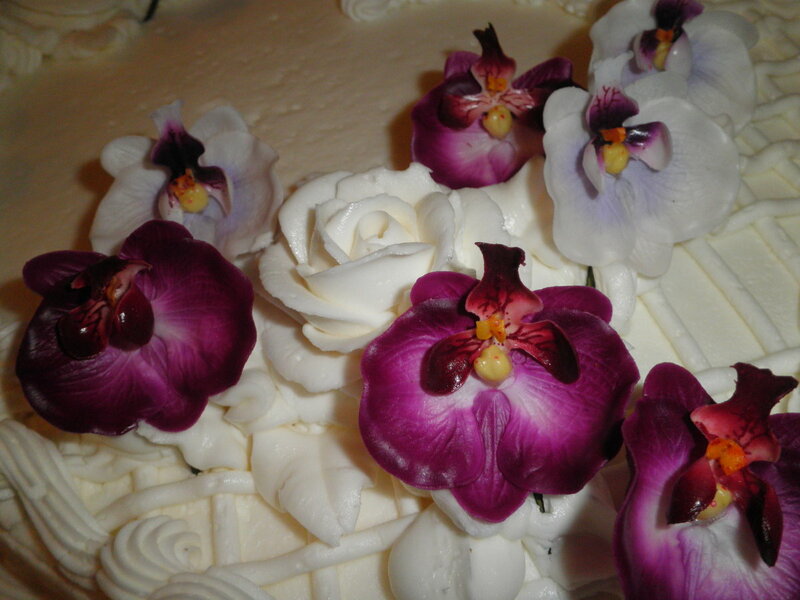 We looked at some images of orchid cakes on Google - and found a simple but elegant cake design with a cascade of orchids down the side. Since the cake is going to be made by a friend, this should be a pretty simple design to copy. We will use some of the flowers from one of the bouquets, and I am also ordering some small latex orchids on EBay to be the main flowers for the top. The cake topper will also go along with the tropical theme: it has a cute beachcomber theme and we will customize the groom to look like TD. Since there are not many ethnic cake toppers available, we found this one and decided we would do the color change on it ourselves (Some cake topper companies will customize colors for you though) The cake topper is pictured to the right, and in the sand it is written "Just Married". The bride and groom are barefoot. Last but not least: Rose is ordering a purple bow-tie for their pit-bull puppy to wear in the formal wedding photos. I am shooting those photos the day before at Shinn Historical Park in Fremont Ca. along with Zeuss, their pitbull puppy. All of Roses photography work will be free, so all they need to worry about is what size and how many wedding photos they want once we look at them in the computer. I will be using a simple but awesome little point and shoot digital camera - the Olympus Stylus 5010. It's important to have fun with the planning! 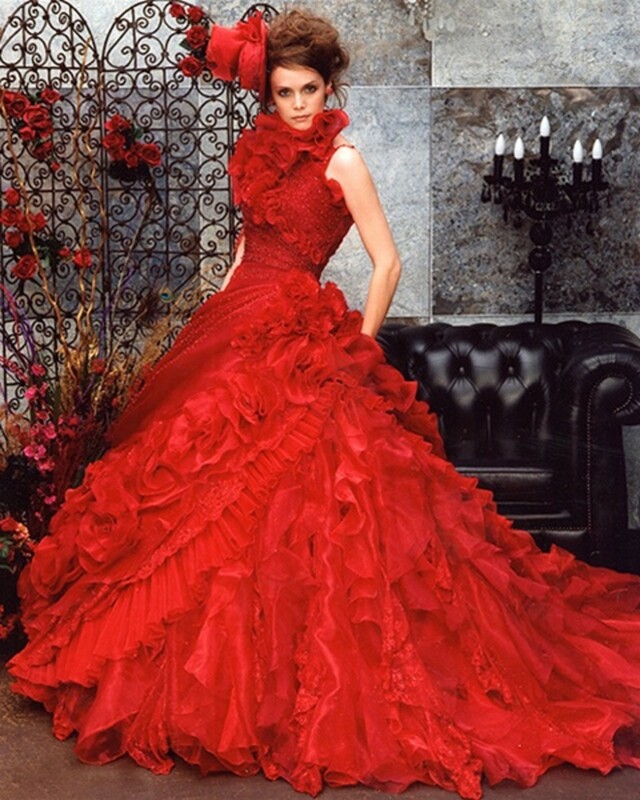 So this is what we have planned so far - when we get to the dresses and attire I will write another hub on that part. Like I said, the budget is to come in under $1,000 - and I think we are going to achieve a beautiful but elegant wedding that everyone will remember. It all started out with just those colors - purple and gold - then came the theme and voila! 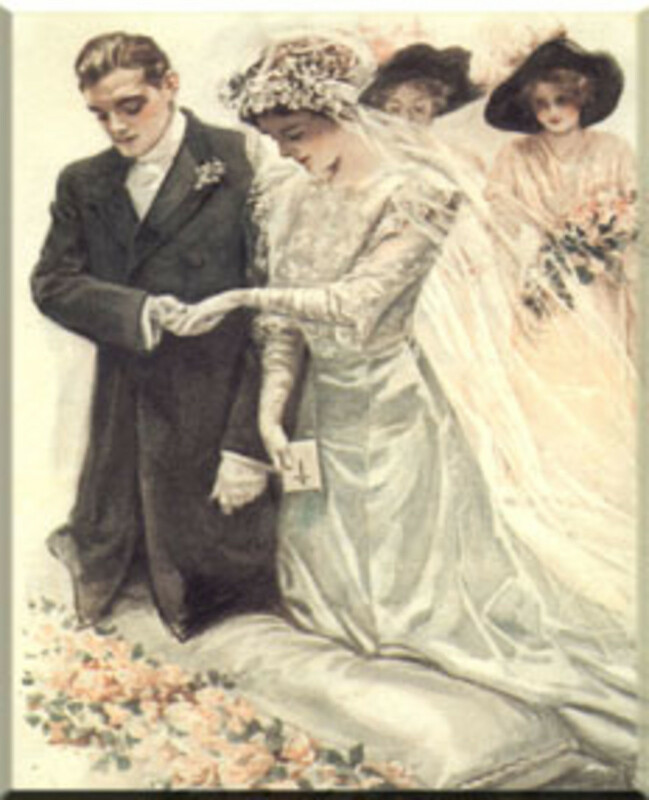 A wedding was planned. Of course there will be other things that come up - but the foundation of the wedding and reception has been planned - at a very budget friendly price. 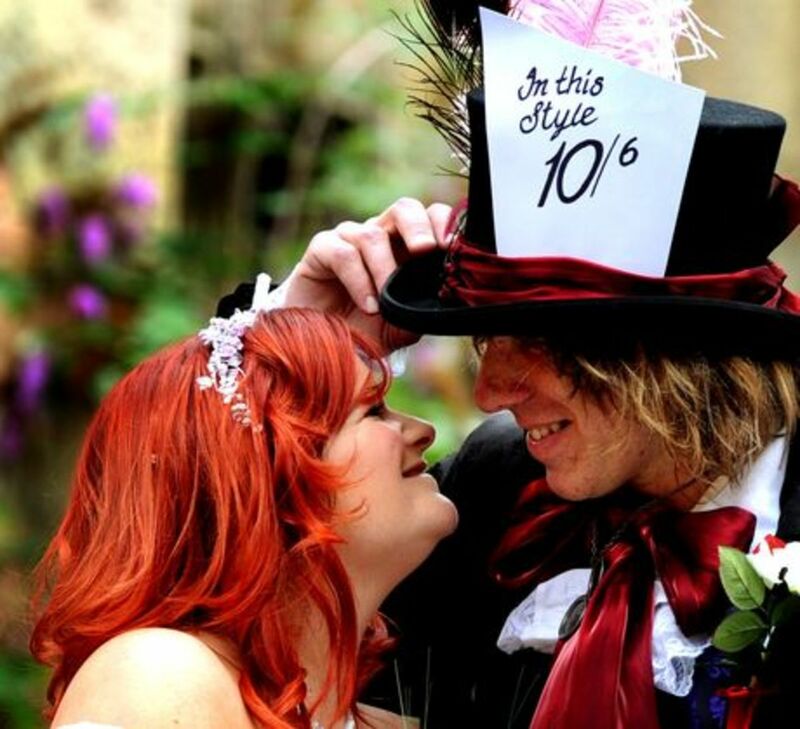 I hope you have enjoyed this hub (article) and I will make sure I post some wedding photos once that day comes. 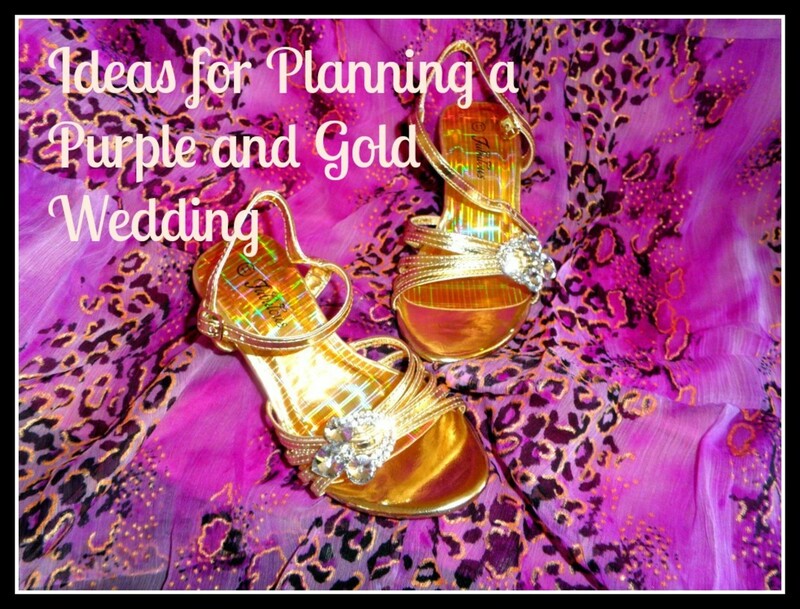 In the meantime, I hope I have given you some good ideas on how to plan a purple and gold wedding on a budget, picking a theme and most of all - to have fun doing it! @Thank you Julie. I love purple too. Such a vibrant color. Love the gold and purple theme idea especially with purple as purple is a spiritual color. @Trish) Thanks so much for the link. I gave it to Rose. I really appreciate you keeping your eyes peeled for deals. Weddings are SO expensive! Dorsi, These are some great ideas for an elegant yet economical wedding! 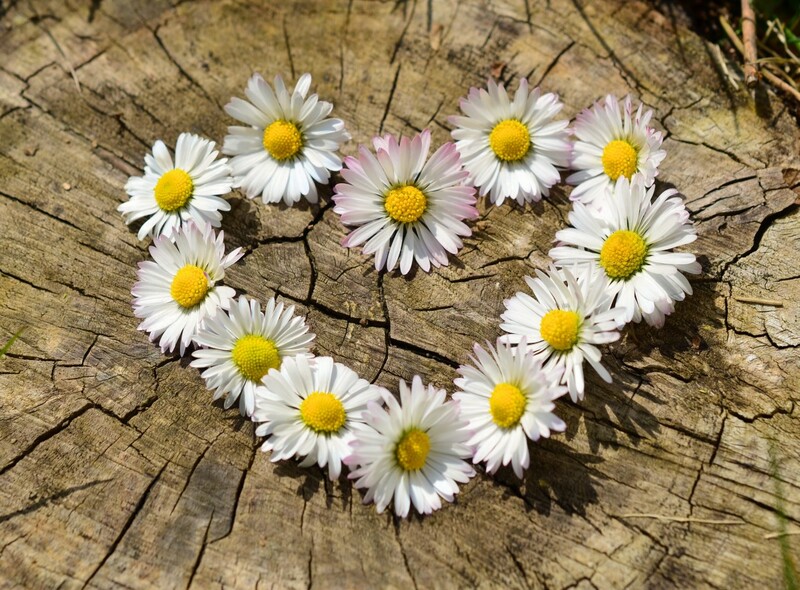 Thank you for sharing, Peace & Blessings! 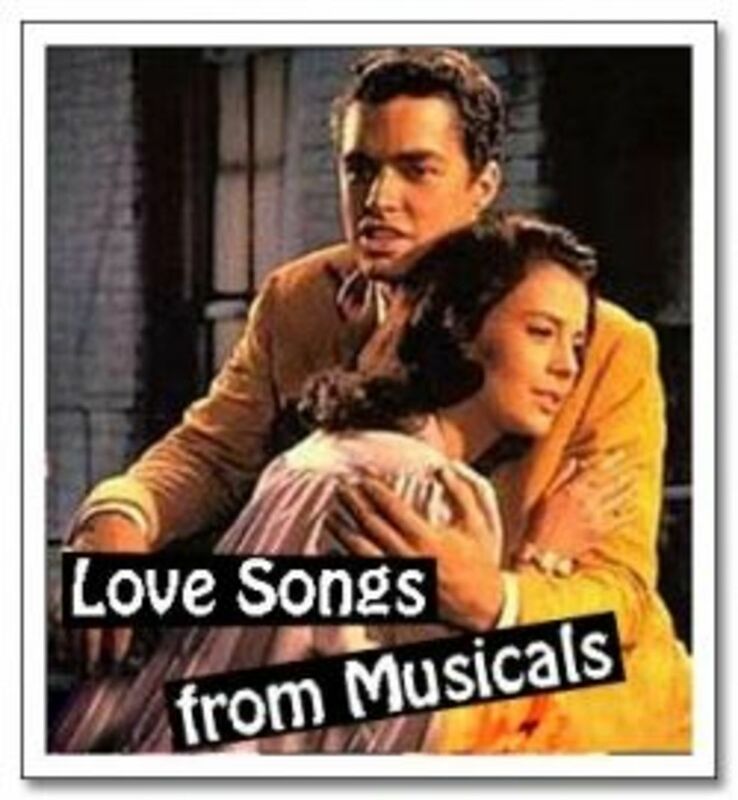 @deflowers) Thanks and glad you stopped by to read! @Millionaire) Thank you and I'll pass on the well wishes to the bride and groom! 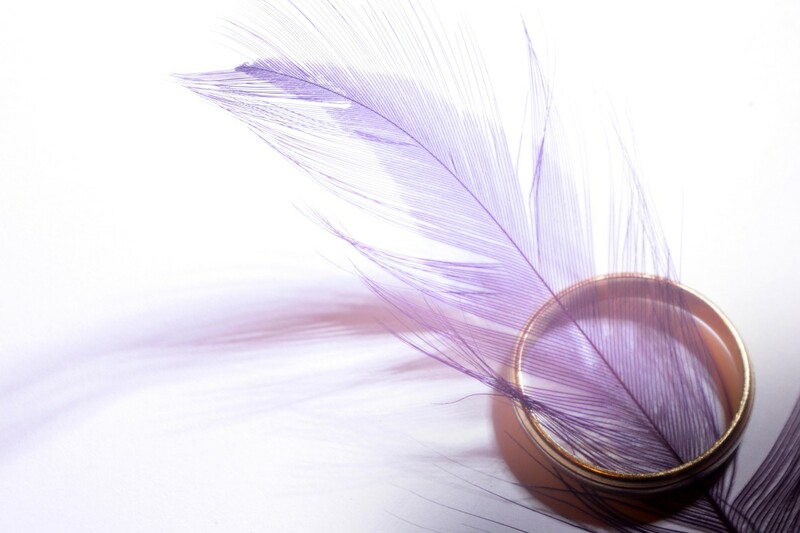 A purple and gold wedding theme sounds lovely, and I think it is great that you were able to plan it inexpensively. Congrats to the bride, groom and wedding planner!